Here’s why. If your answer is all about your “Low Prices”, you probably aren’t making enough profit. Congratulations, you just won the race to the bottom. If your answer is about how your business has the best “Customer Service”, congratulations again on spreading the BS because nobody cares or will believe you. People only believe other people about customer service awesomeness. They don’t believe companies that brag about it. I don’t, and I’ll bet you don’t either. So why say that in your own business? So if you can’t talk about price, customer service, or quality in your business marketing what you should focus on? Let’s take a look and maybe shake out some new ideas for your shop. One idea for your business is to sell on emotion. How your product or service makes someone feel deep down. Think about how your business plays into a human to human connection. Don’t tout features and benefits. Play up the joy. Describe what victory feels like. Illustrate that fist pump awesomeness of your favorite band. What does the fear of missing out or being embarrassed feel like? That’s what you have to show. Why do people buy those $35 concert tees? I’m sure they look fantastic, but it’s not because it’s a rational decision. It’s an emotional purchase that screams to everyone, “I WAS THERE”. For the business to business apparel, having a coordinated professional look exemplifies confidence. You are selling that idea. Not a logoed golf shirt or apron. Can you get behind the psychology of why people buy? Focus on the real issue people need to solve. They don’t need another shirt. What they want is tied to an emotion. That’s what you have to unravel. Emotion is much more important than logic. People don’t buy cars based on logic. They don’t buy apparel based on logic either. Does that shirt give you status? It shows that you are a member of a tribe or a community. An example could be for your favorite sports team or band. If you wear the shirt you are included. Why do people do business with me or buy my shirts? What external problem are they solving? Can you describe the main pain point that is resolved? What is the internal source of that pain? Why do they feel that way? Can you name the internal relief they are feeling when they do business with you or buy your shirts? Why do they feel that way? It’s funky stuff. Too difficult? Just think about what pressures someone may be facing. For a small business, they want to be seen as a bigger one. More established. Trustworthy. Does that happen with the bottom of the barrel apparel, or something higher end? Are you pre-judging them based on something? Why not root out the psychology behind their internal pain points and see what you can uncover? Sorry, couldn’t help the Bowie reference. Let’s talk about pressure points for a second for your customers. You may have never thought about this before. This is feelings of inadequacy. That you don’t belong. Maybe some frustration or humiliation with past experiences. That there is potential for ridicule. Fear of missing opportunities. Of not hitting that big sales quota. Doing a good job so the boss notices or they get a promotion. Maybe that they may lose money. There’s history there lurking, can they meet expectations? Are they in the group, tribe, or community? Do they meet the standards? Of wanting to succeed badly. There is anger or resentment. The need to be happy. To not be embarrassed. To please others. Time. Resources used. How much effort needs to be used? So think about how you present your business to your customers. Do you know like the back of your hand your customer’s pain points and pressures that they are trying to overcome? Or are you simply squawking about your “big sale” that you post every time your shop runs out of scheduled work? Stop for a second and think about how you present yourself to your current and potential customers. People feel these pressures. When you solve something for them that addresses their pain haven’t you noticed how elated they get? You need to dig into why that happens. Absolutely ask your customer questions that define these pressure points. 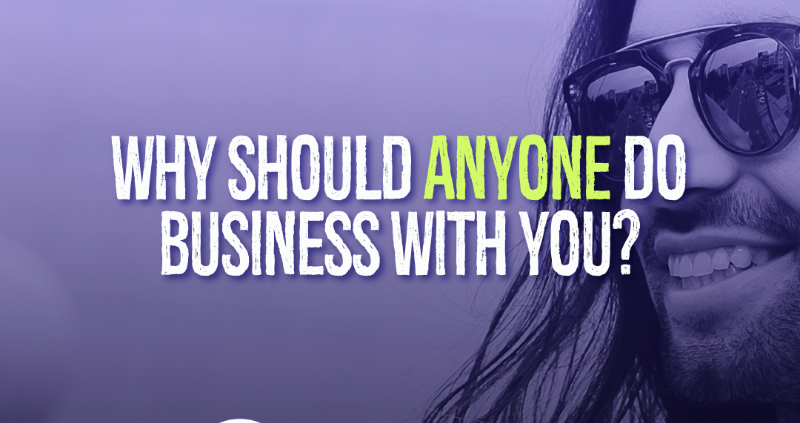 How you answer that problem is how you should be marketing your business. Tunnel down and discover how your customer’s internal and external problems need to be resolved. Because you have the answers to solve their problems. That’s the value they crave and will shout out from the mountaintops. How is your screen-printing pricing built? Did you use the “average of all the shops around me” method? That doesn’t work. In fact, it’s one of the main reasons why shops go out of business every year. Instead, I’d like to teach you a better way. In this eBook, “Price for Profit” you can learn how to use your shop’s production efficiency coupled with your shop’s costs to build a price matrix that makes sense. Because it uses not only your costs but how you work to determine your pricing. It’s your math. Use it to your advantage. Get your copy today. For $59, learn do to it the right way. 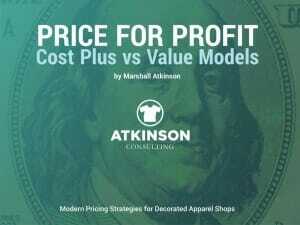 Tags: Apparel, Atkinson Consulting, coach, Community, Cultural, Customer Service, Emotion, Emotional, Financial, Logic, Logistic, Marketing, Marshall Atkinson, Pain Point, Pressure, Price, Psychology, Quality, Sale, Sales, Sell, social, solve, T-shirt, Tribe, Why Should Anyone Do Business With You?